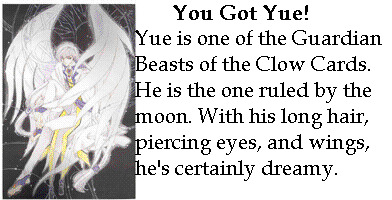 Yue is the Guardian Beast of the Clow Cards that is ruled by the moon. He is the one that passes judgement on the Card Captor(s). In reality, he doesn't have a gender, however, we fangirls like to think that he's male. After all, he has a male's voice, and he looks ve-ry bishounen.